One of the main reasons I started the Epic Backlog Blog way back in early 2009 was to motivate myself to play through some of the video games that I missed out on (as well as to finally finish some of the ones that I had started but left idle). Since then, I've been able to complete every game that I've started (or re-started), finding at least some modicum of enjoyment or personal fulfillment in even the most dated and abstruse titles in my pile of shame. This all changed a few months ago when I started playing Deus Ex for the first time. After hearing so many of the gaming press superstars (perhaps the most among these being former 1UP dude Garnett Lee) heap wondrous praises upon the game, I snagged it on Steam during a sale celebrating the game's 10th birthday. I wanted to have the experience, and I wanted to share it with my readers. It didn't quite work out as I expected. At first, I really enjoyed what the game had to offer in terms of storytelling and openness to various approaches in gameplay. Perhaps this was nothing more than me being the recipient of some vicarious nostalgia, but the feeling wore off around the time that I made it to Hong-Kong. 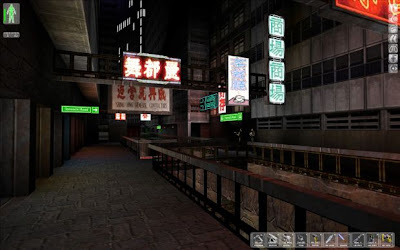 By this time, my interest in the narrative had dissolved, and I no longer had a reason to navigate the environment, which looked nothing like how anyone should envision a futuristic Hong-Kong. I had hit the wall with Deus Ex. I found myself only able to play the game for 15 minutes at a time before quiting, not necessarily out of frustration but of pure apathy. I struggled to decide whether or not it would be worth it to force myself to press through the last two thirds of the game with no enjoyment while the games that I was enjoying sat unfinished on my desk (at the time, Metal Gear Solid: Peace Walker and Dragon Quest IX). I finally gave up on Deus Ex and unistalled the game forever, finally freeing myself from the burden of un-enjoyment that it presented. I have to vow that as long as I'm not getting payed to play games—and I haven't seen one penny as of yet—I will not force myself to play a game that I cannnot enjoy. After all, what are video games for if not to fill us with delight? And so I turn to you, dear reader, and ask: what game (or games) have you wanted to love but just could not find it in your heart to enjoy? I'll start this out by saying that I'm currently not enjoying the original Baldur's Gate. I'm not sure what it is exactly, but I just don't find myself wanting to play it. It might just become the second game that I give up on forever. Surprisingly enough for me it's been Mass Effect, I'm still under the illusion I'll begin to enjoy it eventually though (12 hours in). To be honest, I don't like Mass Effect either. It's been sitting on my desktop computer, and I never feel like playing it. Every time I hear someone talk about Deus Ex, I have to fight the urge to give it another chance.